Nearly a week after claiming the co-regular season title with Albany, Stony Brook Men’s Lacrosse ended its season with an 8-4 defeat to the Vermont Catamounts on Thursday, May 3 at Casey Stadium in Albany. 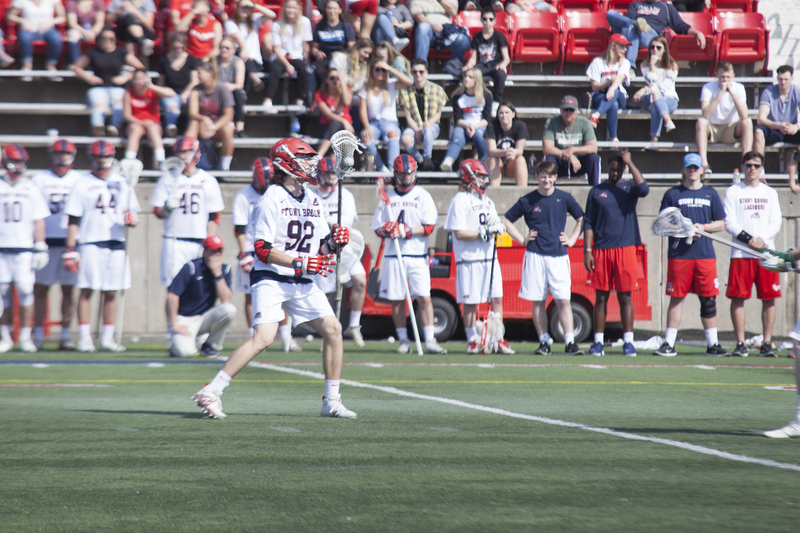 The two teams’ last matchup was on April 14, when Stony Brook got the upper hand in an 8-7 double-overtime victory. Sophomore midfielder Wayne White notched two points on goal and an assist in Thursday’s matchup, just as he did when the two teams last faced each other. White scored the final goal of the season for the Seawolves with 8:10 remaining in the fourth period. Freshman midfielder Mike McCannell displayed a dominant offensive presence, netting the first two Stony Brook goals which put his team ahead by one. The team’s offensive unit put pressure on the Catamounts, notching a total of 20 shots on net; however, only four shots found the back of the cage. Sophomore goalkeeper Michael Bollinger was awarded the starting spot in net. Bollinger saved nine shots on 17 shots on goal, posing a save percentage of 53, the highest since the team’s last matchup against Vermont when he tallied a save percentage of 70. Stony Brook appeared to have been keeping up with Vermont for a majority of the contest, yet the team failed to capitalize on its opportunities around the net. Vermont sophomore goalkeeper Nick Washuta stopped numerous high-quality Stony Brook opportunities and saved 16 shots on the day while allowing just four past. Going into halftime, both teams were even at three goals apiece. Vermont led Stony Brook in both shots and saves by one and each team turned over the ball five times. The Seawolves led in faceoffs 4-3, which they have struggled with throughout the season. The Seawolves were awarded five man-advantage opportunities throughout the game, but only scored on one opportunity thanks to McCannell. The Catamounts converted on 50 percent of their man-advantage opportunities, capitalizing with 13:29 left in the fourth period on Catamounts redshirt-senior midfielder Ian MacKay’s goal. Vermont will move on to the America East Championship final for the first time since 2016 when it lost to No. 4 Hartford 17-16. Vermont’s record now improves to 12-3, while Stony Brook finishes the year off with a record of 7-8, posting a sub-.500 winning percentage for the first time since 2014. An earlier version of this story incorrectly spelled Vermont redshirt-senior midfielder Ian MacKay’s last name as McKay.